Space Case Titanium Grinders are cut from solid aircraft aluminum and then anodized with a special black titanium alloy. This finish takes the finest grinder and adds increased durability and scratch resistance as well as a non stick surface. 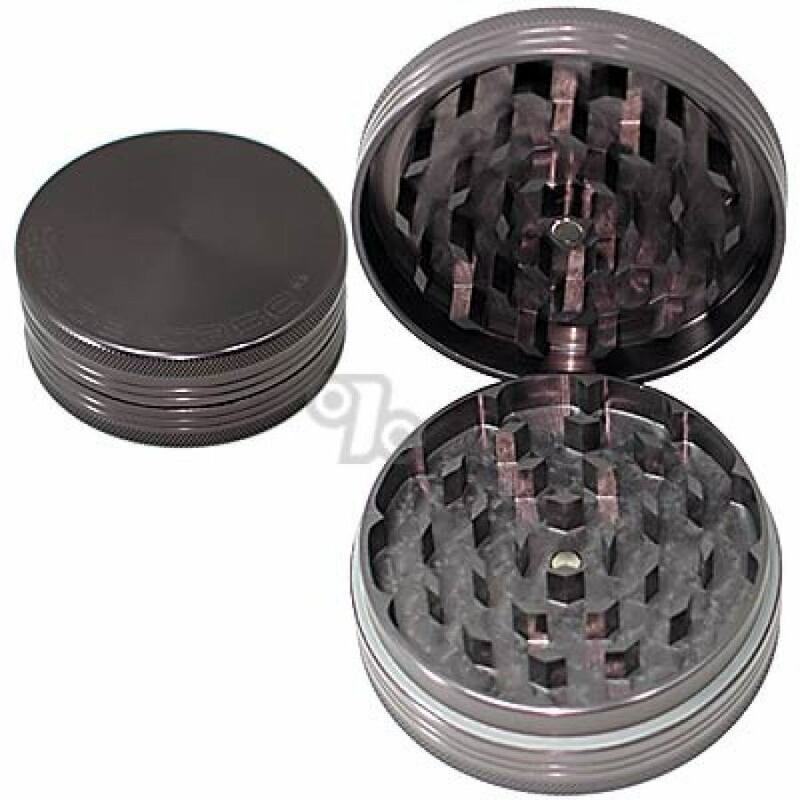 This 2 piece Titanium Space Case grinder can shred anything you put in its diamond shaped teeth! A neodymium magnet securely holds this herb grinder together when traveling. Approximate external diameter is 2 3/8 inches with an approximate height of 1 inch. Genuine SpaceCase Grinders are made in the USA from the finest materials and finished to perfection. They may cost a little more but they're so good they're Guaranteed for Life; No Questions asked (if real)! Be careful of cheap knock-offs. Great item. Not too heavy. This grinder is great. I use it often. My grinder does a fantastic job, it leaves your tobacco (MJ) fluffy and ready too roll up or pack your one hit quartz glass cigarette bat easily too fill , catching all the powder or Keif as I like to call it at the bottom for a special day. Don't spend money on a cheap Chinese grinder. This is the real deal. Extra sharp titanium teeth do an incredible job of preparing your smoke. Used to own a Space Case titanium Large, and it was almost too big to be practical. This is the perfect size, and don't be fooled, it still collects a LOT of kief even for being a 2 piece; keep a small flathead screwdriver around. 38 years and never tried one of these - unbelievable, won't go back, great product. Easy to use, does a real nice job. Fit and finish are excellent with a nice consistency of polish and anodizing. The limited checkering and lettering are crisp and consistent. Top notch American product.